When it comes to luxury, Mayfair is the place to be. 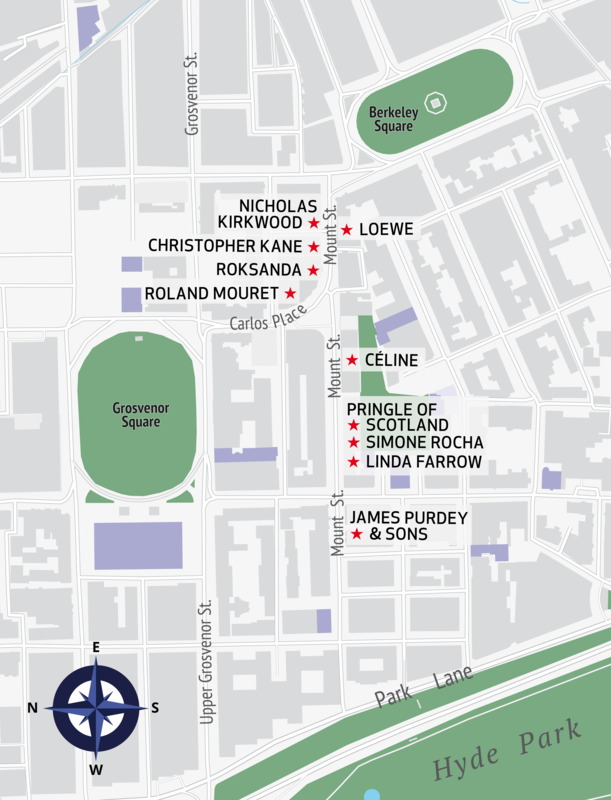 The centre of the Mayfair luxury fashion scene is Mount Street, home to some of the world’s most luxurious labels. Founded in 1815, Pringle of Scotland is one of the longest-established heritage brands in the UK, and was one of the world’s first luxury knitwear specialist manufacturers. Serbian designer Roksanda Ilincic has become one of the most recognisable faces on the London fashion scene. Known for playful collections of cocktail dresses, Roksanda is a brand to turn to for effortless elegance. Innovative Irish designer Simone Rocha is among London’s fastest rising fashion talents. After finding a place on the London Fashion Week schedule in 2010, the designer has gone on to win critical acclaim. Established in 1970, Linda Farrow was one of the world’s first luxury eyewear brands. Originally a fashion designer, Farrow was a pioneer in sunglasses design, and one of the first to treat eyewear as a fashion item. In the past decade Loewe has experienced a reinvention. With young Northern Irish designer Jonathan Anderson of JW Anderson as creative director, the Spanish fashion house has found a new lease of life. Undeniably one of the most coveted fashion brands of the moment, French fashion house Céline has perfected elegant, contemporary minimalism. Central Saint Martins graduate and London Fashion Week stalwart Christopher Kane has become one of the most popular designers on Mount Street. With a history stretching back over 200 years and three royal warrants to its name, James Purdey & Sons is one of the most distinctively British brands on Mount Street. French designer Roland Mouret’s single-name dresses, Galaxy, Moon and Titanium, are known internationally. Epitomising structured, figure-hugging elegance, Mouret’s dresses have been worn by some of the most photographed women in the world. British footwear designer Nicholas Kirkwood has been creating some of the most sought-after boots and heels in London for more than a decade. Each area of London has its own distinctive style. East London is famed for its cutting-edge, independent emerging fashion scene. Clerkenwell is a hub of innovative design, while Chelsea and the King’s Road have been synonymous with sophisticated style for decades. However, when it comes to luxury, Mayfair is the place to be. The centre of the Mayfair luxury fashion scene is Mount Street, home to some of the world’s most luxurious labels. Described by some as the more discreet little sister to neighbouring Bond Street, Mount Street is undeniably one of the most exclusive shopping streets in the world. Many of its luxurious labels are British or have British designers at the helm. Here we’ve selected the 10 best designers to buy on the street, and you can download our handy map of the stores here. Founded in 1815, Pringle of Scotland is one of the longest-established heritage brands in the UK, and was one of the world’s first luxury knitwear specialist manufacturers. The brand’s store on Mount Street is a haven for fans of cashmere, which can be found woven into the brand’s signature argyle pattern on cardigans, jumpers and twinsets. In recent years Pringle has been celebrated for its ability to match traditional materials with contemporary, cutting-edge designs, garnering a younger base of fashion-forward fans who appreciate the brand’s impressive heritage. Serbian designer Roksanda Ilincic has become one of the most recognisable faces on the London fashion scene. Known for playful collections of cocktail dresses, Roksanda is a brand to turn to for effortless elegance. With fans ranging from the Duchess of Cambridge to Hollywood star Cate Blanchett, Roksanda designs are some of the most photographed in the world. Roksanda’s Mount Street store, designed in collaboration with award-winning British architect David Adjaye, opened in summer 2014, and features an elegant herringbone-patterned marble floor and colourful fabric-covered walls, making it the perfect embodiment of the brand’s style. Innovative Irish designer Simone Rocha is among London’s fastest rising fashion talents. After finding a place on the London Fashion Week schedule in 2010, the designer has gone on to win critical acclaim and was named best British womenswear designer at the 2016 Fashion Awards. Her store on Mount Street is known for its inventive, eye-catching window displays, designed by Rocha herself; inside visitors will find Rocha’s signature furniture and hand-made sculptures, as well as collections inspired by the designer’s take on femininity, beauty and style. Established in 1970, Linda Farrow was one of the world’s first luxury eyewear brands. Originally a fashion designer, Farrow was a pioneer in sunglasses design, and one of the first to treat eyewear as a fashion item. Today, Farrow’s son is at the helm of the family company, and, inspired by his mother’s vintage designs, the brand continues to create some of the most beautiful and eye-catching sunglasses in the world. At the brand’s Mount Street gallery, visitors will find Farrow collections alongside collaborations with leading names in fashion such as Dries Van Noten, Jeremy Scott and Phillip Lim. In the past decade Loewe has experienced a reinvention. With young Northern Irish designer Jonathan Anderson of JW Anderson as creative director, the Spanish fashion house has found a new lease of life. While Loewe creates full ready-to-wear collections, it was originally a leather specialist, and remains a go-to brand for beautifully crafted, fashion-forward leather bags. Loewe’s bags are still handmade by skilled craftspeople at a workshop near Madrid; it combines heritage and tradition with exciting designs that have become the label’s calling card. The mix is more than enough of an excuse to visit Loewe on Mount Street. Undeniably one of the most coveted fashion brands of the moment, French fashion house Céline has perfected elegant, contemporary minimalism. With Brit Phoebe Philo as creative director, the brand has found success in ready-to-wear collections and accessories, particularly handbags – the Trapeze and the Phantom are two of the most sought-after bags of recent years. At Céline’s Mount Street store, visitors can experience the elegant, minimal luxury expressed in the brand’s collections, and, with entire rooms dedicated to bags and shoes, it’s not difficult to see why this is one of the most popular boutiques on the street. Central Saint Martins graduate and London Fashion Week stalwart Christopher Kane has become one of the most popular designers on Mount Street. The store, on the corner of Carpenter Street, features Kane’s full collections, this season all inspired by artwork from Galerie Gugging, created by patients of the Maria Gugging Psychiatric Clinic in Austria, where art is used as therapy. Works of art currently sit among the collection and are available to buy, giving visitors to the store the unique opportunity to purchase not only a piece from the collection, but also the art that inspired it. With a history stretching back over 200 years and three royal warrants to its name, James Purdey & Sons is one of the most distinctively British brands on Mount Street. Historically a gun and rifle maker, the brand has expanded into all aspects of country living. With full ready-to-wear collections of men’s and women’s clothing, all geared towards country living, as well as leather goods, including boots, bags and an array of small leather accessories, the store on the corner of Mount Street and South Audley Street is the perfect place to pick up something quintessentially British. French designer Roland Mouret’s single-name dresses, Galaxy, Moon and Titanium, are known internationally. Epitomising structured, figure-hugging elegance, Mouret’s dresses have been worn by some of the most photographed women in the world, from Victoria Beckham to Jennifer Aniston. The brand’s store, a Grade II-listed townhouse on Carlos Place (technically not quite Mount Street, but close enough) is more of a home for the brand than a store, and offers exclusive services, including by-appointment personal shopping and alterations to ensure the Mouret creation you purchase fits perfectly. British footwear designer Nicholas Kirkwood has been creating some of the most sought-after boots and heels in London for more than a decade. The brand’s store on Mount Street was redesigned last year under the careful direction of Kirkwood himself, who has a hand in all aspect of the boutique’s style, from the chevron-patterned floors in dark wood to the notes of leather and tobacco in the fragrances that scent the space. The ever-changing shop window concepts never fail to the catch the eye of passers-by, ensuring the store is a suitable home for his much-loved architectural creations.